New Brompton Colors – J.C. Lind Bike Co.
As summer falls into autumn, here at J.C. Lind we’re lookin’ forward to the slight chill in the air, long sleeves, colorful trees, pumpkins and their gourd friends, baseball and all its championship happenings, and for Brompton – the perfectly sized, utilitarian, multi-modal folding bike that goes wherever you go, inside and out – and its new, fun colors: Hot Pink, Flame Lacquer, Purple Metallic, and Papyrus White. The bike literally folds smaller than the last sentence, and to be honest, it’s way more fun, too. Nevertheless, in appreciation of these atmospheric changes and a desire to spice up the season, and hopefully a few people’s lives, we were quick (possibly the first?!) 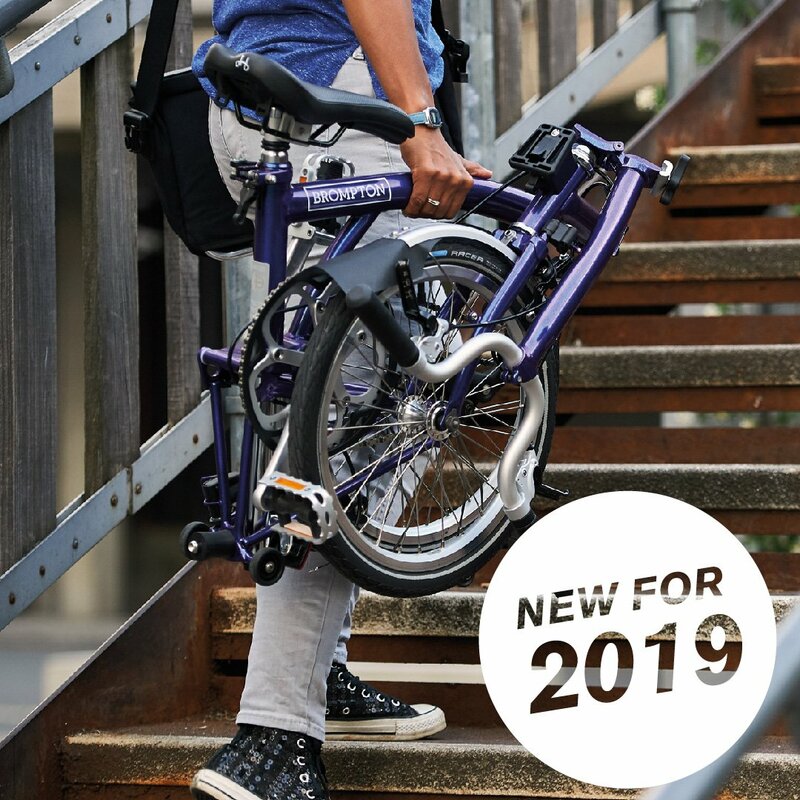 to order a new Purple Metallic Brompton and a Hot Pink Brompton for our current inventory (ETA November 2018 they’re now here!). The Purple Metallic is a premium color; it’s a bit more in price (+$250 up-charge), but it’s a lot more to look at – like metallic flakes that glisten in the sunlight. We built it as a M6L, so it has the “M” handlebars, 6 speeds, and fenders. We also added dynamo lighting – front and rear lighting that is powered by you and your pedaling and all your luminous affections. The Hot Pink is an attention grabbing crowd favorite that, after a brief hiatus, the public demanded to have back. Brompton did just that and so did we. Our Hot Pink Brompton is a M3L, so it has the “M” handlebars, 3 speeds, fenders, and is an uncomplicated style that’s fun to ride. So if you’re excited about these bikes like we are, check out our website for more information (Purple Metallic M6L & Hot Pink M3L) but then stop by the shop to say hi and see these bikes in person. Let’s celebrate the changing complexion of the fall with colorful new bikes. * It’s been 47 days. Summer is history, autumn is giving up and leaving us, and the “slight chill in the air” is now slightly above or below freezing. But even though it’s pretty much dark by lunch time, we have something brilliant … the new Purple Metallic Brompton! It finally arrived here at The Shop, and we can’t stop looking at it (which can be a problem when you’re riding it). So come on over to The Shop and look at our (or maybe your?!) new Purple Metallic AND Hot Pink Brompton.